Notes: This is a remote LCD control display. It is supposed to be plugged into a 3-CPU control board for functionality. This display is designed for use with the Edwards EST3 fire alarm system. Picture 3 shows an example of what the display looks like when functional. The first line shows the current system time and the number of active (a) and disabled (d) points. Lines 2, 3, and 4 display the “current event”, i.e., the first abnormal, unacknowledged event received. Lines 5, 6, and 7 display the “last event”, i.e., the latest event that happened within the system. Line 8 is simply a total of how many types of each event have accumulated. 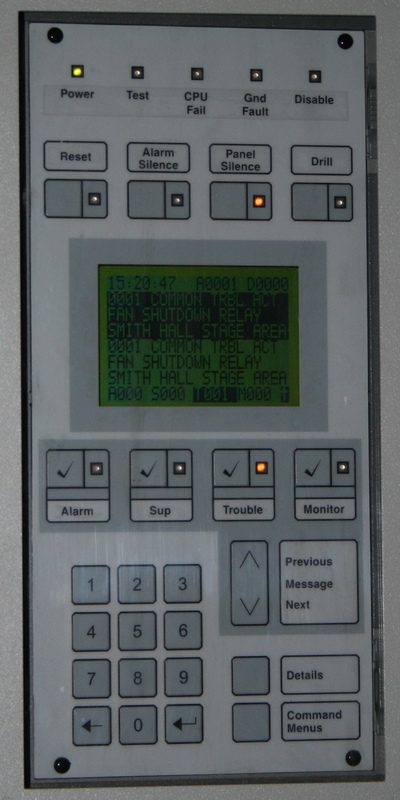 The highest priority events (alarms) are displayed first, followed by supervisory, trouble, and monitor conditions. When hooked up to the 3-CPU control board, an internal piezo also sounds that corresponds to the type of event. The piezo does the “3-3-3” Pattern for alarm and monitor conditions, the “2-2” Pattern for supervisory conditions, and 30 pulses per minute for trouble conditions. Using programming, the user can also customize the flash-rate of the LEDs.